My friend starting using Ustream from his iPhone recently and recorded this drive on the highway in Tokyo tonight. He was driving back from the golf range coming over the Rainbow Bridge past Odaiba and into Tokyo. You can see Tokyo Tower in the picture and the colors of the Rainbow Bridge. I will also be starting some live stream Ustream action soon. You can follow me on Ustream to get announcements of upcoming live streams. I really enjoyed the live just now. It feels good to see Tokyo Tower live. The bridge and Tokyo Tower look amazing lit up. I didn’t get a chance to see it in this kind of view when i went during the summer. RT @tweetmeme Tokyo Night Driving Live, Japan Roads | Shibuya246 http://bit.ly/7HUuxO Extra added value to an already great site. I am now following you on Ustream. Sounds like your friend likes country music, “Daytime friends and nightime lovers, they don’t want to hurt the other. So they love in the nighttime and shake hands in the light of day.” Great song from the 90’s. Hope to see more of this kind of thing in the near future here. 🙂 May be a conbini post or something w/Rilakkuma in it, that would be Epic. 🙂 Have to check out the video from the golf course now. 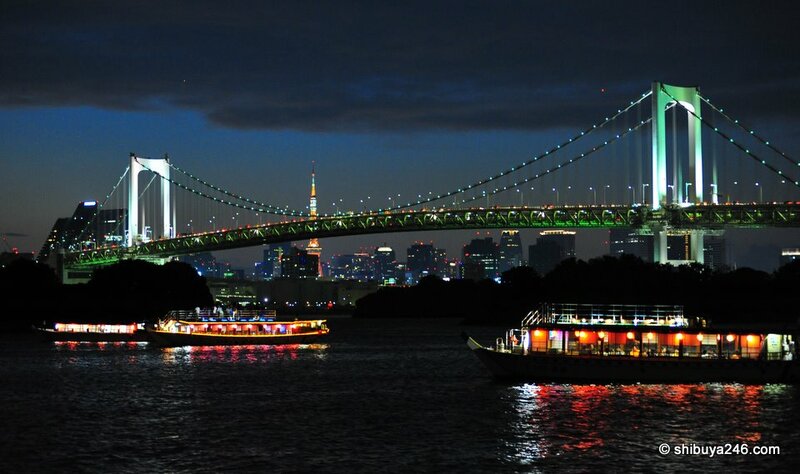 Really nice shot of the Rainbow bridge with the Tokyo skyline behind it. I haven’t been there in a while, will need to remedy that soon.